Art historian Patrick Flores takes us on a tour of the Philippine Pavilion, Tie A String Around the World, in this year’s Venice Biennale. 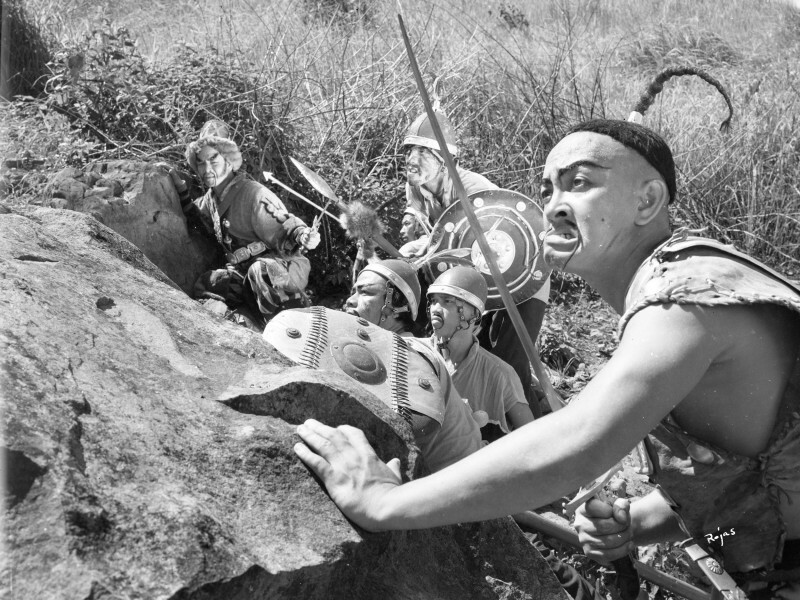 The exhibition takes off from Genghis Khan, a film created by Filipino director Manuel Conde, which screened at the Venice Film Festival in 1952. Conde’s work would then go on to gain global recognition as a cinematic landmark. The movie provokes thoughts on how modern empires are made, and reflects Filipino creativity, modernity, and cultural ambiguity. Similar elements can be found in the works of more contemporary artists showing at the Pavilion, namely filmmaker Manny Montelibano and multimedia artist Jose Tence Ruiz. Flores also reveals the challenges and complexities of putting up such a project, and his views on developing Philippine art. Tie A String Around the World is on view now at the Palazzo Mora in Venice and open to the public until 22 November 2015. “I wanted to show that the Philippines was in the world and we are not coming into Venice as if it were the first time for us to be in this context,” curator Patrick Flores explains, referring to the Philippine Pavilion at the 56th Venice Biennale, which opened to the public last 9 May. Entitled Tie A String Around the World, the Pavilion is a comeback of sorts for the country, having last joined the Biennale 51 years ago. 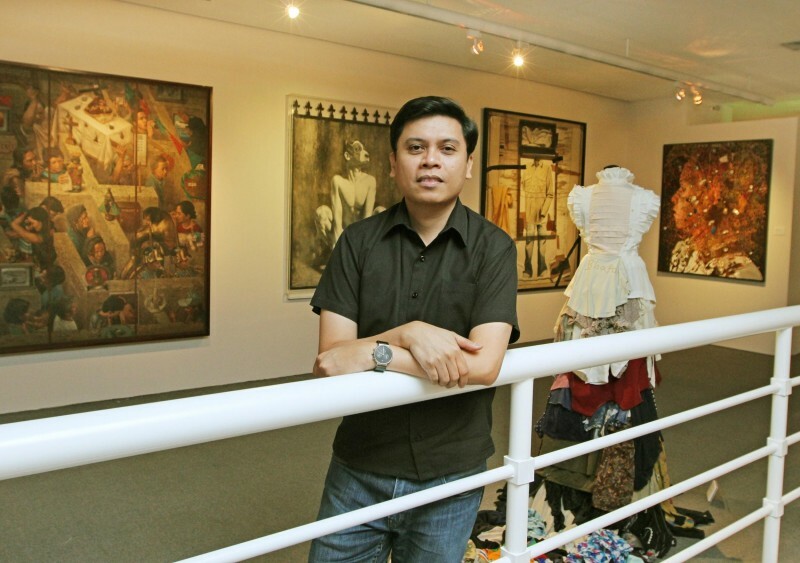 Patrick Flores, also an art historian and curator of the Jorge B. Vargas Museum, has turned to the classic Filipino film, Genghis Khan, for inspiration. Created in 1950 by Manuel Conde on a shoestring budget, the movie was screened at the Venice Film Festival in 1952 before it went on to gain global recognition as a cinematic landmark. It tells the tale of a young Genghis Khan, who, at the end of the film, promises his beloved that he would “tie a string around the world” and lay it at her feet, alluding to an empire he had yet to build. The story brings forward thoughts on worldmaking - how countries or empires are built through the creation of boundaries and limits. The theme led Flores to the issue of territorial disputes, particularly the case of the Philippines and China on the South China Sea. “The claim over the South China Sea is important. It is common patrimony, but if a superpower would like to claim almost 80 percent of it, that tells us something,” he remarks. Putting up the Philippine Pavilion after 51 years did not come without challenges. Read on as contributor Lai del Rosario asks Flores about the lessons learned, the relevance of the project, and his views on developing Philippine art. LDR: How did you decide to choose Genghis Khan as a take-off point for the exhibition? PF: Our participation was a return so I wanted to include something that had already gone to Venice. Genghis Khan was in the Venice Film Festival in 1952. It was also screened at the Museum of Modern Art (MoMa) in New York in the same year and at the Centre Pompidou in Paris in 1981. For me, the film is something that at the outset will surmount the local-global dichotomy. It was indeed something to be able to produce such a work without prior models. At the same time, it presented a fascination with history and fantasy. There was a sense of ‘the other world’ in Genghis Khan, such as Mongolia and the Gobi Desert. My idea was a tribute to the culture that was able to make such a filmic proposition. The story also offers something on worldmaking, one of the Pavilion’s themes. LDR: What can we expect to see at the Pavilion? PF: I wanted to show that the Philippines was in the world and we are not coming into Venice as if it were the first time for us to be in this context. I am using Genghis Khan as a trajectory because it was a seminal film. In fact it was the first film ever on Genghis Khan, and it was produced in the Philippines. It was a very precocious effort on the part of its Filipino filmmaker, Manuel Conde, to aspire to produce such a work, together with Carlos Francisco, co-writer and production designer. The film has been newly restored and will be shown on a loop at the Pavilion. Another work is a film by Manny Montelibano, which is largely about Bataraza, a municipality in Palawan - the gateway to the South China Sea and Borneo. Montelibano’s work is a sound and video installation and relies heavily on an oral epic in the region. This epic is then disturbed by Chinese radio frequency, the point being that the encroachment of China is pervasive through sound. Another installation, “Shoal,” by Jose Tence Ruiz is based on the ship, BRP Sierra Madre, the Philippines’ marine headquarters tasked to assert Philippine sovereignty amidst the country’s territorial dispute with China. The ship was given to the government by the United States after the Vietnam War in the 1970s. It looks pathetic, almost like a ruin, and Ruiz’s work references this. His installation is a ship but it could also be a church because of the spires. It is ambiguous - it is both bricolage and Baroque. LDR: What do you hope to achieve in this exhibition? PF: I would like to invest in an extensive, discursive possibility through the Pavilion. It is a difficult and expensive project to set up. The budget was secured during the Typhoon Yolanda (Haiyan) tragedy, so I think we owe it to the country to spend the money very well by creating as many possibilities around the Pavilion as we can. Through it, we hope to maximize publicity, generate attention on the Philippines, and consequently stimulate interest in Philippine art and art history. Additionally, I wanted to converse with the Biennale's theme, “All the World’s Cultures,” as conceived by curator Okwui Enwezor. It is a political proposition that I would like our country to be part of. LDR: Do you think it is a good thing that the Philippines is participating in the Biennale at this point in time? PF: In a way, yes. I am not really a fan of participating in Biennales but it is already there and I understand why some people would want to. I would like to make the most of it by learning from the processes involved, such as the project selection process, logistics, or how to work with the Philippine government and the Biennale. For me, the Biennale is a platform and I do not believe in a hierarchy of platforms as each one has its own requirements, limitations, and potential. What I do as the curator of Vargas Museum is just as important as what I do in Venice. At the same time, the Biennale is a global platform where people will take notice of who we are, so it is also good. But I think there are other ways of developing the local art scene - grassroots and local initiatives are equally important. All these platforms address different concerns. LDR: How do you think the world will view the Philippines through the Pavilion? PF: Good question, and it is difficult to calculate. I want people to view the Philippines as having a very strong modernity that was able to mediate the world in very eccentric, idiosyncratic ways. For instance, the critics were confounded by Genghis Khan. They did not really know how to make sense of the film. They thought it was nice enough to be shown abroad and translated in 16 languages. But when I look at the reviews, critics thought it was clumsy, awkward. The editing was not up to par and there were things they could not seem to appreciate but felt were good. It was irresistible for them and they could not not show it. Once the film showed, people took notice - Hollywood, Venice, Europe and America. That means something. I would like the world to view the Philippines as something imagined from that modernity and with contemporary artists like Montelibano and Ruiz also responding equivalently. To an extent, the history of Philippine art was built on that - that kind of eccentricity, idiosyncrasy, and difficulty to pin down. Of course, I fear that the film will not survive the translation and might not be understood, but this difficulty is part of it. The Philippine Pavilion is located at the second floor of the European Cultural Centre – Palazzo Mora and is open to the public from 9 May to 22 November 2015. The Philippine Pavilion is commissioned by the National Commission for Culture and the Arts, with the support of the Department of Foreign Affairs and the Office of Senator Loren Legarda. Lai del Rosario is an art manager and freelance writer with a keen interest in European-Asian artistic collaborations, having lived and worked in Switzerland, France, and the Philippines. She is also currently developing an online platform that promotes creative spaces in cities.